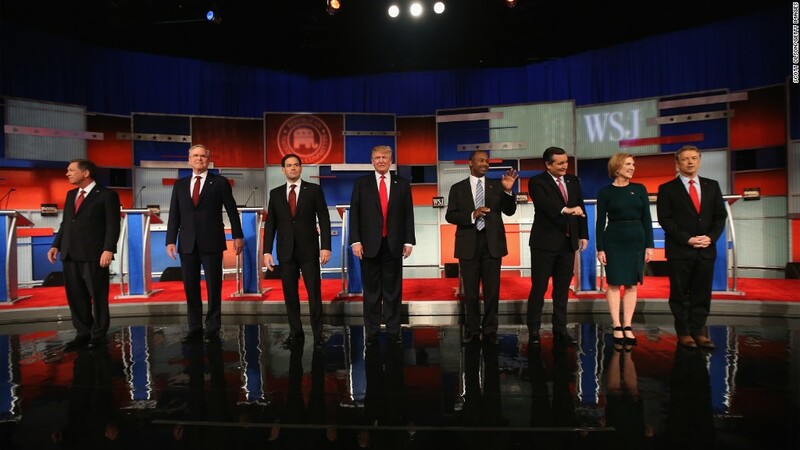 Fox Business Network's prime time GOP debate drew 13.5 million viewers, according to Nielsen ratings data. The total is just shy of the 14 million viewer total for CNBC's debate two weeks ago. The Nielsen data doesn't count online viewership. Fox Business live-streamed the debate to make it available to more people. A spokeswoman said the stream peaked with 1.4 million concurrent viewers, roughly the same number that streamed the Super Bowl earlier this year. The previous record for a primary debate live-stream was CNN's Democratic debate just a few weeks ago, which peaked with 980,000 online viewers. Up until this year, primary season debates in the months before the Iowa caucuses usually averaged a few million viewers -- primarily political junkies. This year is very different. Donald Trump has received (and has taken) much of the credit for an extraordinary surge in viewership. The first three Republican primary debates set new ratings records for Fox News, CNN and CNBC. Tuesday's match-up will easily set a new record for the eight-year-old Fox Business, as well. While Tuesday night's numbers were sky-high, both of the business channels had a smaller audience than Fox News and CNN had. Those channels had far bigger audiences -- roughly 25 million viewers -- for debates in August and September. Some air may be leaking out of the debate ratings balloon, but the viewership totals are still remarkably high. Fox Business was at a slight disadvantage versus CNBC because it is not available in as many homes. But it had a scheduling advantage: CNBC's debate was up against a World Series game while Fox's was not. Fox's version was certainly better reviewed than CNBC's, although some journalists groused that the Fox moderators lobbed too many softball questions at the candidates. Fox's undercard debate at 7 p.m. was much higher rated than CNBC's equivalent, perhaps because Mike Huckabee and Chris Christie were on the stage. The undercard had an average of 4.7 million viewers. Ahead of Tuesday's debates, co-moderator Maria Bartiromo said: "This is an opportunity for us to make sure the world knows what the Fox Business Network is." The network sought to capitalize on the big audience for the debate by having its biggest stars on the air. Lou Dobbs anchored live coverage in between the two debates; co-moderator Neil Cavuto led the coverage right afterward; and Bartiromo hosted a special edition of morning show from Milwaukee on Wednesday morning. Fox Business is also using the debate as a launchpad for a new season of its highest-rated show, the documentary series "Strange Inheritance." The network is premiering four new episodes in a row on Wednesday night.